Our family at Duke University - happy with the study results! 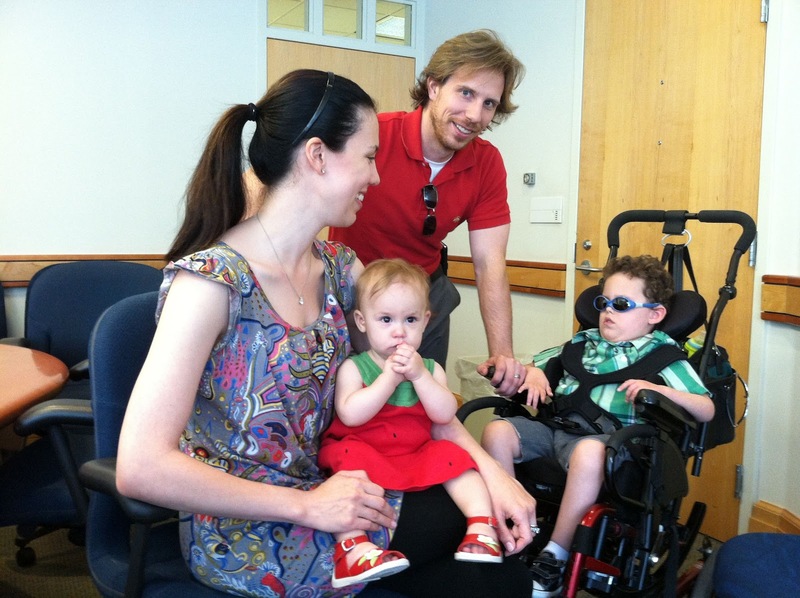 On May 3, 2012, after four long years of searching, Bertrand finally received a diagnosis! The result. We could undertake PGD IVF if desired. 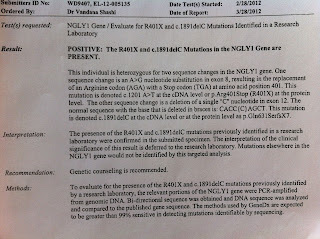 Last week, we went to Duke University (as several readers guessed) to receive the official results of a study entitled "Genomic Study of Developmental Delay and Congenital Anomalies of Unknown Etiology" that our family joined back in July 2010. Using next generation sequencing, the fabulous researchers at Duke University discovered that Bertrand inherited 2 distinct mutations in the NGLY1 gene: a frameshift in exon 12 from me and a nonsense mutation in exon 8 from Matthew. 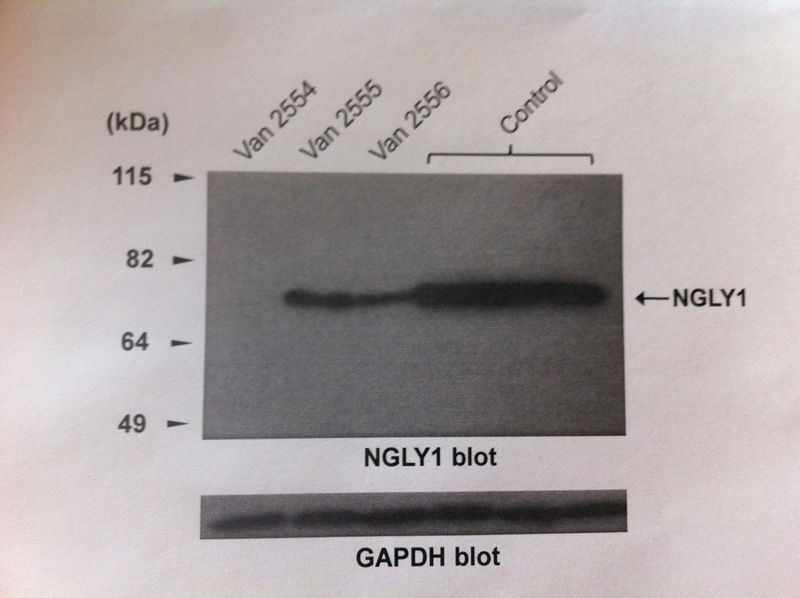 NGLY1 encodes N-glycanase 1, which is the enzyme involved with the degradation of misfolded N-linked glycoproteins. Bertrand, Cristina, Matthew and control NGLY1 expression. 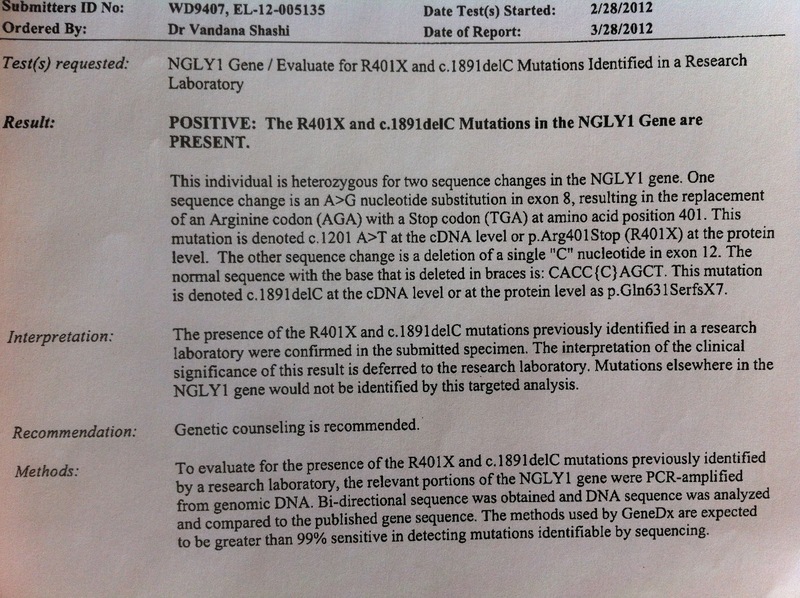 In Matthew and my case, we each have a normal copy of NGLY1 to compensate for our mutated copies. We each produce about half the N-glycanase as a normal person. However, with both mutations, Bertrand produces basically none. This leads to the build-up of misfolded glycoproteins in his cells. This is why Bertrand's phenotype is consistent with a congenital disorder of glycosylation and there are similarities with other storage disorders. Bertrand is the first documented case of an NGLY1 disorder. Efforts are currently underway to confirm a second case of N-glycanase deficiency and establish causality. You read that right: within 2 weeks we may know for certain if another child has the same kind of disorder as Bertrand! And, after that, other similar but undiagnosed children may be tested for errors in NGLY1 as well. We finally have an answer. Something to write in on forms. Something to easily say when people ask about Bertrand. And, as more NGLY1 children are found, we will no longer be alone. Huge news!! Very happy you have some answers and I hope this helps you moving forward! This must take so much weight off of your familys shoulders. Finally you can stop looking and instead have a specific diagnosis to understand (with time). You certainly did not give up. Were they able to explain everything to you? Did it click into place? So happy for you!! Does this now suggest which therapies are more likely to help? HURRAH!!! Although we still don't know what caused them, I remember how very relieved I was when they gave Jade's seizure disorder a name. I imagine that this feels a kazillion times better for you! Congratulations to you for your persistence and we're rooting for you as you enter the next stage of this journey. Reading your news gave me chills--especially the last line: We will no longer be alone. Congratulations-your persistence and dedication have paid off, not just for you, but for generations of children and families to come. We are so glad that you finally have a diagnosis--hope it will bring you some sort of peace and way to proceed. We wish him and you the very best.